Words fail us in the face of Islamic State’s (IS) destruction of ancient treasures in Syria and Iraq, captured in their own videos last week and released to an uncomprehending world. We are on surer ground with their clips of beheadings and mass executions; all but the most fanatical adherents to IS’ extreme interpretation of Sunni Islam have been united in revulsion at their grisly spectacle. But on the violent end of things much more permanent than us – things built to last for hundreds even thousands of years, importing meaning to the myths and narratives we create about ourselves – we grasp for an appropriate response, writes TERENCE MCNAMEE. Can the deliberate ruin of archaeology or art, in its extreme form referred to as ‘cultural genocide’, ever be worth a human life? This is not a new question. The devastation to Europe’s cultural heritage wrought by the Second World War led to the 1954 Hague Convention on the protection of cultural property in armed conflict, which to date has been ratified by 126 states, including the US, China, Russia and nearly all European countries. Though weakly applied, the convention nevertheless reflects a broad desire for our collective culture to persist in time immemorial. Built heritage, writes Jeff Sparrow, is our “sole consolation for the inescapability of our death”. If the Hague Convention had a poster boy it would be Tony Clarke. In 1944 the young, art-loving British Army officer was in charge of an artillery unit perched above Sansepolcro, a town in Tuscany, central Italy, thought to be in German hands. Just as his guns started firing, he remembered an essay by Aldous Huxley in which the novelist adoringly proclaims a fresco by Italian renaissance master Piero della Francesca to be the “greatest picture in the world”. It was called The Resurrection. And it was in Sansepolcro’s town hall. Defying his superior’s orders to keep firing, Clarke ordered an immediate halt and kept the guns silent until the following day when Allied troops liberated the town. The risks he took to save The Resurrection, not least to himself, were immense. In this exceptional act Clarke made it clear some art is worth dying for. The same was said in 2001 when the Taliban dynamited the giant Bamiyan Buddhas to dust. The monumental figures, carved out of a cliff northwest of Afghanistan’s capital, Kabul, had stood for 1,500 years. But since the Buddhas were representative of an alternative system of thought and identity – in this case, Hazara Shias’ – to the extreme Sunni Islam practiced by the Taliban, they had to go. The Hague Convention and near-universal international opprobrium had no impact on Taliban leader Mullah Omar, who boasted that his followers would henceforth be known as “destroyers of idols”. IS’ latest frenzy of religious iconoclasm is grist to the mill for Islam’s critics, who see cultural genocide as yet another abhorrent practice – along with beheading, forced marriage and so on – unique to Islamic fundamentalism. To the list of their recent assaults on human heritage one could add the destruction of libraries, ancient manuscripts and monuments of medieval Islamic culture by Islamist rebels in 2013 in Timbuktu, for centuries one of Africa’s great centres of learning and trade. Even the Saudi Kingdom, guardian of Islam’s holiest site, Mecca, have failed to preserve and in many cases demolished religio-historical sites associated with early Islam that are at odds with their strict Wahhabism. Intolerance must be central to Islam’s DNA if it engages in this kind of cultural cannibalism, surely? That view may be gaining currency but history says something rather different. In times of war Muslim leaders – notably great ones such as Mehmed the Conqueror and Saladin – frequently opted to convert their enemies’ places of worship into mosques or universities rather than destroy them. Though contrary examples abound, the command to protect civilian property from military destruction as prescribed in mainstream Islamic teaching was often respected. Christianity has generally been less accommodating to its enemies’ cultural and architectural store. And not just in ancient times. In the early 1990s Croat and Serb forces laid waste to a significant chunk of Bosnia’s Muslim heritage. Libraries, mosques and perhaps most infamously, the Stari Most Bridge – a glorious feat of Ottoman engineering which had linked the two sides of Mostar since the mid-16th century and symbolised Islam’s historic place in the Balkans – were deliberately blown up. Multiply what happened in Bosnia a thousand times and one might get close to understanding what happened in the Americas after Columbus arrived. The built culture of some of history’s greatest civilisations – Mayan, Aztec, Inca – was virtually wiped out at the hands of Christian Europeans in a genocidal campaign of conquest and conversion. But lest everything be blamed on religion, we need only to recall the countless churches, synagogues, and monasteries ravaged by secular despots – Stalin, Hitler, Mao – in the 20th century. They bear sad testimony to what might simply be a human problem: an instinct to crush histories that clash with our own. Robert Bevan’s seminal work ‘The Destruction of Memory: Architecture at War’ published in 2006 raised the worrying prospect that that instinct might reside in all of us; it just needs the trigger of communal conflict to get the wrecking ball going. Bevan’s book excavated thousands of years of human history to illustrate how the cultural artefacts of a people or nation have been deliberately destroyed as a means to dominate, terrorise, divide or eradicate them altogether. Some bridges or buildings are not just bridges or buildings. They are, in Bevan’s words, “containers of meaning”, tangible proof of a community’s existence, which reaches into the past and gives sense and direction to its future. “I wish I had died,” one ordinary Iraqi despaired after viewing what IS did to his statues, “my own soul has been stolen”. Containers of meaning need not be affirmations of a people’s greatness, they can instead be monuments to their greatest calamities, as with Auschwitz for Jews or the House of Slaves on Gorée Island for African Americans. The point Bevan convincingly argued was that attempts by one group to “enforce forgetting” – to erase the memory, history and identity another group attaches to a place or object – often prefigures attempts to eliminate the group itself. That’s certainly how the Assyrian people of Iraq and Syria feel right now. As with most great scholarship, Bevan’s book raised more questions than it answered. Is it better to rebuild and construct replicas, as was done throughout Europe after the Second World War and more recently to Mostar’s bridge, in defiance of the madness of war? Or should ruins be left as ruins, like the empty caverns in Bamiyan where the Buddhas once stood, as salutary reminders of man’s capacity for evil? Syrians may not have a choice once the carnage in their country ends. The scale of restoration required for war ravaged cities like Aleppo – first settled more than 10,000 years ago and the only city in the world where architecture from every period of Islamic civilisation exists (or used to) – would be so vast one wonders if sufficient will or money could ever be mustered. Much of the damage to Aleppo and other historic sites in Syria is not the result of deliberate attacks on the nation’s heritage but rather, to use the justly hated term, ‘collateral damage’. The Hague Convention draws no meaningful distinction between indiscriminate bombing and shelling and what IS is doing. However damage is inflicted on cultural property belonging to any people, it represents, according to the preamble, “damage to the cultural heritage of all mankind, since each people makes its contribution to the culture of the world”. There is a particular onus on occupying powers – of late, that’s shorthand for the US and UK – to actively protect cultural sites made vulnerable by the chaos of war. The US failure to halt the looting of Baghdad’s National Museum in 2003, an embarrassment for Washington amplified by Donald Rumsfeld’s infamous quip “stuff happens” – blithely dismissing what for Iraqis was an incalculable loss to their heritage – gave impetus to its ratification of the convention in 2009. The United Kingdom, shamefully and somewhat bewilderingly, is the only major power that has not yet ratified the convention. Clarke must be turning in his grave. South Africa has ratified the treaty but around 20 African countries have not, more than any other continent. I am not sure why. It could be a simple lack of awareness or a sense that the convention is not especially relevant in the African context. Not relevant, perhaps, because traditions and values tend to resonate much more strongly in Africa than built culture. Or because the destruction of cultural property has not been a significant feature of armed conflict in Africa in pre- or post-colonial times (wars waged by the colonialists are another story). If it were, what might have received the IS treatment? Top of many liberationists’ list would have been the Voortrekker Monument in Pretoria. Once the shrine of Afrikanerdom, consciously designed to be the physical embodiment of Afrikaner culture’s core ideas and myths (the ‘chosen people’), it was aptly described in FW de Klerk’s 1998 memoir as “half-church, half-fortress”. The fortified walls of the vast granite building convey impregnability and permanence. It was built to last forever. De Klerk wrote that the Voortrekker Monument is “a reminder of the ideals which had inspired me when I was a young man”. Now picture throngs of ANC Youth League members climbing over it in 1994 with hammers and pick axes. Though (understandably) few South Africans feel any affinity towards the building, there is only the faintest prospect it would ever be demolished. That would represent an acute betrayal of the principles that underpinned the liberation struggle, to be sure, but I think most would just regard it as totally unnecessary. Yet that is exactly the sort of thing happening today in, of all places, the birthplace of human civilisation. 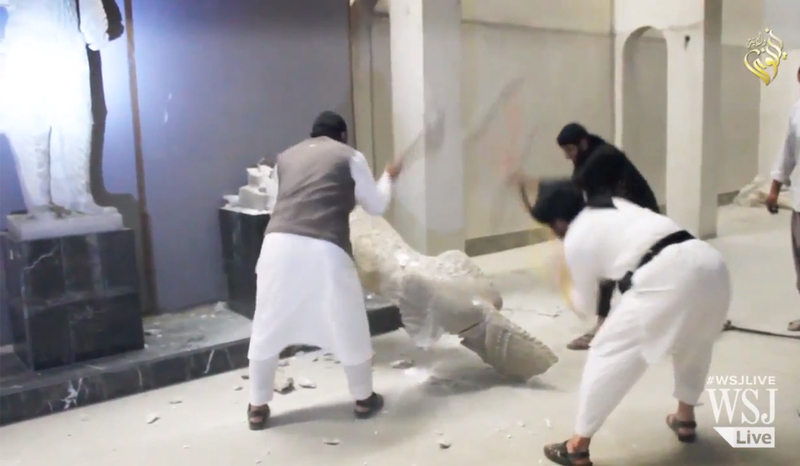 IS is waging war on peoples’ heritage but it’s not their only agenda. Political and economic motives are at play, too. IS is looting as much as they are destroying, selling stolen antiquities to criminals and antique dealers on the black market to fund their Caliphate. The videos are also meant as propaganda, advertising IS’ power. They provide, Michael Danti contends, “a back story” for IS to appeal to young fighters who wish to be part of “massive unstoppable forces”. Head of the United Nations Educational, Scientific and Cultural Organisation (Unesco), Irina Bokova, deplored the recent destruction in Mosul as not simply a cultural tragedy but a dangerous security threat since it could “fuel sectarianism, violent extremism and conflict” in the region. Her remark returns us to my initial question: how do we place a value on cultural property when humans are dying in their thousands? For many, the answer is clear: we should not fetishise built objects or reify the past over the world we live in today. In 2011 I visited Cambodia’s awe-inspiring Angkor Wat, the largest religious monument in the world. Over hundreds of years war and conquest saw its temples defaced or altered to represent first Hindu gods, then Buddhism, then back to Hinduism. At the time I marvelled at the jumbled mix of cultures and their evocation of political and social history in that part of the world. And that’s the thing. The distance of history can render abstract, even fascinating, that which today we would find repugnant. No one wants IS to start painting its logo on the broken faces of Assyrian statues. I shudder at the prospect that any of the world’s extant heritages could be mowed down to “make way for a new age”. In historical terms, the idea of respect for built culture, especially that which is not within one’s own tradition, is relatively new. And in this digital and disposable age, we are creating less physical heritage that is meant to last forever. Against the tide of ephemera, renowned British commentator Simon Jenkins, one of the staunchest advocates of restoration wherever possible, has rightly urged the international community to assist Syria en masse after the war “in honour of the collective memory that war sought to rupture”. Active protection of heritage is the more immediate challenge. The conflicts in Libya, Syria and Iraq expose the stark limits of what the international community is prepared to do to halt mass bloodletting, let alone save buildings. Experts are divided over how to embolden the Hague Convention and prevent IS from inflicting even greater damage to cultural property in the Middle East. Networks of officials and concerned scholars are trying to keep track via satellite imagery and other means with what’s happening on the ground and retaining close contacts with their Syrian and Iraqi colleagues, but no one is certain what’s at risk. Nor is there agreement on whether it would be better to provoke international alarm by publicising the treasures in IS’ path or keep quiet and hope they miss them. Agonisingly, a full accounting is impossible because many sites have yet to be properly excavated, if at all.